A role at the Reserve Bank beckons for one of the key faces of Harbour Asset Management. 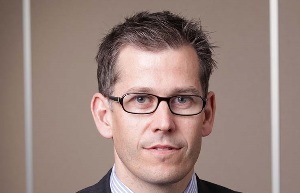 Christian Hawkesby, founding head of fixed income for Harbour Asset Management, has been appointed as an assistant governor at the Reserve Bank of New Zealand. “We are very sad to have accepted Christian’s resignation. He has been an amazing colleague and leader for Harbour as we have grown a successful business, however this is a rare opportunity for him that is too good to turn down.” said Andrew Bascand, Harbour's managing director. “We wish him the very best with his exciting new role”. He will remain at Harbour until the end of February to ensure a smooth transition. Mark Brown, founding fixed interest portfolio manager for Harbour, assumes the role of head of fixed income and continues as portfolio manager for Harbour’s core fixed interest, corporate bond and income funds. Supporting him will be George Henderson who moves into the role of portfolio manager for Harbour’s short duration and cash portfolios, in addition to his role as investment analyst supporting all our fixed interest portfolios. Simon Pannett becomes senior credit analyst, continuing to build the depth and quality of Harbour’s credit research and fixed interest security analysis, providing key support for our Income Fund. There will be no change in investment process as a result of Hawkesby’s departure. Harbour will also be seeking to employ an investment analyst to join the fixed interest team over the next few months. “We recognise Christian's significant contribution across the wider Harbour business that has seen us grow significantly. Recently our fixed interest funds under management surpassed NZ$2 billion which is testament to Christian and Mark’s solid track record over the past eight years," said chairman Graeme Wong.